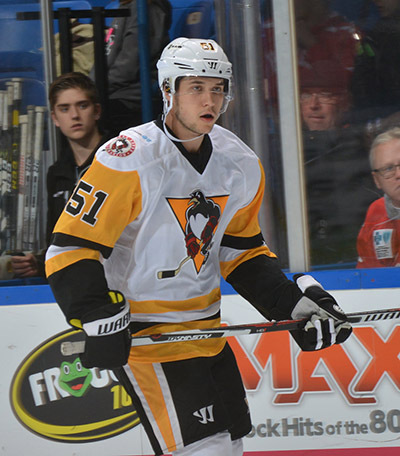 Derrick Pouliot has received a qualifying offer from the Penguins. The news of his qualifying offer was buried behind offers made to NHL regulars: Sheary, Dumoulin, Schultz and also AHLers: Archibald, Dea, and Corrado. It seems half of Pens fans are shocked by this move. Chad Ruhwedel and David Warsofsky appeared to have passed Pouliot on the depth chart in Pittsburgh and the general word on the street is that he is a “bust”. The other half of Penguins fans are simply indifferent towards the fate of an AHL defenseman. They shouldn’t be. Pouliot is a smart hockey player. He is patient on the power play and has a lethal shot. Pouliot has the kind of raw talent that other serviceable AHL defensemen simply do not have. The elephant in the room though is that Derik Pouliot has not yet been ready for full time duty in the NHL. At this point Pouliot has played 67 games in the NHL and has 2 goals and 12 assists. He is 23-year-old. Defenseman Brian Dumoulin is 25. Two years ago when he was 23, Dumoulin had played just 19 NHL games. That’s 48 games less than Pouliot has played. 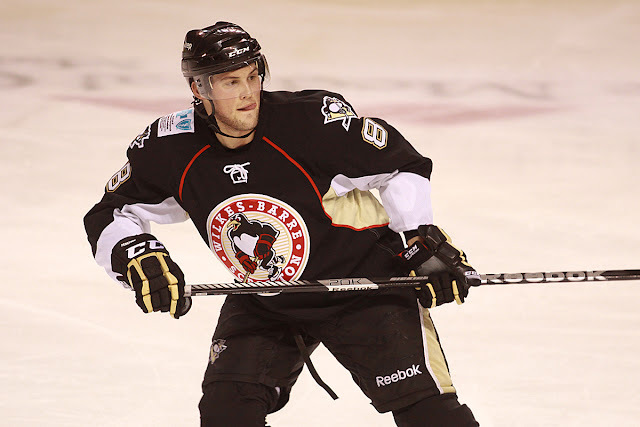 Dumoulin wearing one of the very best WBS sweaters in 2012-2013. 23 year old Dumoulin had 1 goal and 1 assist. That’s half as many goals as Pouliot now has and 11 less assists. Over the past two seasons largely spent in WBS, Pouliot has also showed tremendous personal growth. In November of 2015 21 year old Pouliot was cited for public drunkenness in Wilkes-Barre. The Times Leader has all the details. He has been incident free ever since and racked up 75 points in the AHL during the past two seasons, including this goal where he skated through every Hershey Bear on the team, all around Hershey Park, and shot the puck into the net from the Kiss Tower. Simply put, Pouliot isn’t a bust. He is a young prospect that still has a ton of promise. GMJR apparently agrees and thinks that Pouliot will be playing with the Penguins next year.